The following are some questions we have been asked about the Yelapa Yoga Retreat . On the Mexican Pacific Coast. There are no roads to Yelapa. Access is by 40 minute boat ride from Puerto Vallarta. Passports are now required for travel to and from Mexico! Fights are into Puerto Vallarta. There are many flights arriving daily from all over the world – many of them are direct. We suggest you arrive in Puerto Vallarta on February 29 and spend the first night in a hotel in Old Puerto Vallarta rather than the newer part of town closer to the airport. SUNDAY MARCH 1st Departure from PUERTO VALLARTA The group will meet NO LATER THAN 1:30PM at the Los Muertos Pier in Puerto Vallarta where Surya will be waiting for you and where the boat will take our group to Yelapa. On our last trip to Yelapa we encountered several enormous whales frolicking in the sea not far from our boat..its a 40 minute beautiful and adventurous ride. The cost of the boat ride from PuertO Vallarta and back is included in the fee. SATURDAY MARCH 7 Departure for PUERTO VALLARTA The group will depart by boat from Yelapa at 9AM arriving in Puerto Vallarta by 9:45AM. Bring Very Little. We will be traveling by boat with a water landing meaning that you need to wear flip flops and shorts or pants you can roll up as we will be landing in mid calf high water.We will be dropped off at a small beach and take a short walk along the path to Pura Vida. The temperature is 60-65 at night and 75 – 80 in the daytime and rain is very unlikely. Yoga mats are provided by the center. Bring only a carry on size bag or duffel and a tote bag. Clothing to bring – This is a super casual scene..no high end resort wear!! actually it would feel quite ridiculous! (You can rinse out clothing in your bathroom to minimize what to bring) It is cool at night and in the morning. Bring a fleece jacket or sweater and shawl, bathing suit, sarong, bathing suit cover-up, 2-3 yoga leggings, a few yoga tops, shorts or capris, and a few tees, a pair of casual flowey pants( jeans, except for travel, will feel restrictive in this laid back, warm vibe), a long sleeve shirt, maybe a simple casual dress for easy transition from massage, very good walking sandals or sneakers ( Yelapa is all trails and very narrow dirt roads) and flip flops, hat, sunscreen,. If you feel inclined a long, fun, summer dress can feel sensual and feminine at the end of a day of practice and swimming..Towels and mats are provided at Pura Vida. Is it safe to travel to Yelapa? Yes. Puerto Vallarta is frequently visited by travelers from all over the world and has a reputation for being very safe. Yelapa is small, without road access and very safe. Pura Vida is a 15-minute walk from the village along a narrow path and very safe. There will be a maximum of 22 participants. 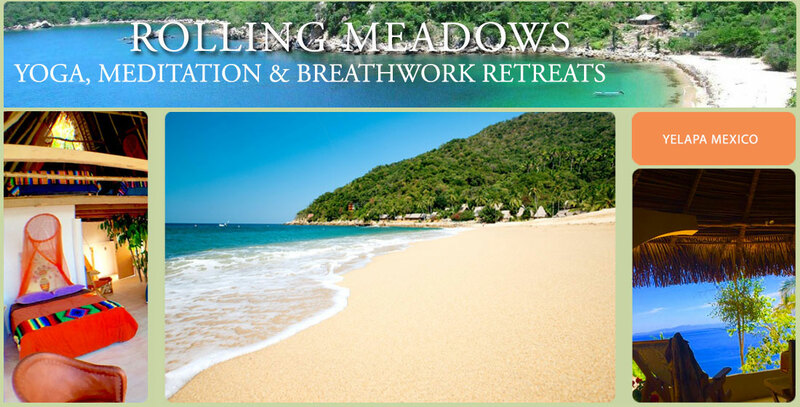 These retreats are suitable for anyone, regardless of age, physical ability or prior experience in yoga, breathwork, and meditation. The teaching is primarily guiding each participant back to their own intuitive knowing. Students come to these retreats for different reasons and with different backgrounds. The retreat experience is unique for everyone, allowing them to have the understanding and experience they need at that particular time. Yes, in a double occupancy room with private bathroom @ $1395 per person. Singles are $1,695. We have studied with many teachers in a variety of styles over the years – including classical hatha yoga, Iyengar, Scaravelli, the Fluid Movement of Continuum, vinyasa, the Viniyoga of Desikachar as well as Vipassana and non-dual meditation, Holotropic and Quantum Light Breathwork as well as work in shamanic traditions. The teaching is a synthesis of all that we have studied for 35 years and what has evolved during years of practice. Go here for more about this. The Yoga Retreats are an opportunity for one to relax and rest in the natural presence/awareness that they are. We feel this is the essence of yoga, meditation, and retreat in general. The schedule, teaching, and environment allow one to let go of the demands and details of daily life and to reconnect with and reveal their own deeper knowing. Yoga postures, breathwork, restorative postures, meditation, silence, and free time in the natural world generally assist in this letting go. As we let go of tension and the busy mind, a deeper knowing that is always present, reveals itself. There is ample opportunity for people to ask questions during the sessions or in private interviews between sessions. While the retreats in Maine are held entirely in “social silence”, the retreats in Mexico have periods of silence. For most of these retreats, we participants are asked to refrain from social conversation after the evening meditation until after brunch the following morning. Of course, anyone may choose to have as much “alone time” as they would like to extend the periods of silence. The will also be other silent periods during the retreat determined by the flow of the retreat process. Most people today have busy lives and spend very little time in silence. Silence is restful, being the mirror of our natural state. Silent community creates a supportive environment in which to deepen understanding, awareness, openness and, compassion. This greatly enhances the benefits of a yoga retreat. There will be early morning tea, fruit and yogurt from 7-8AM before the morning session and a hearty brunch at 10AM and dinner at 6PM. All meals are healthy vegetarian, carefully prepared by local women with fresh, local ingredients. Where is Pura Vida located? About a 15-minute walk from the small village of Yelapa along a narrow patch that skirts the sea. It is at the far South end of the small bay and offers deep tranquility at the edge of the sea with the jungle behind it.